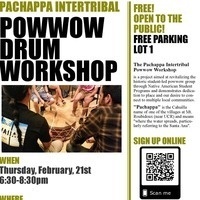 The Pachappa Intertribal Powwow Workshop is a project aimed at revitalizing the historic student-led powwow group through Native American Student Programs and demonstrates dedication to place and our desire to connect to multiple local communities. "Pachappa" is the Cahuilla name of one of the villages at Mt. Roubidoux (near UCR) and means "where the water spreads, particularly referring to the Santa Ana".